Perhaps you have an old wooden bench, chairs, table, or rocking chair that you would like to put outside on your deck, patio, or porch. The indoor furniture needs to be treated for outdoor use. It needs to be cleaned and treated with a wood stain and sealant. A good stain for wood combines the stain color and sealant in one product. It makes it easy to just stain the furniture without use two products. A good stain penetrates the wood and prevents chipping and peeling from rain, heat, wind, and snow. It can be used for indoor or outdoor wood furniture. Indoor furniture will not last if furniture designed for the outdoors. Whether you have one piece or several the surface must be prepared before you use the wood stain and sealant on it. Indoor wood furniture should be cleaned by removing stains, dust and dirt with a soft cloth. It should be sanded to remove splinters and imperfections in the wood. Once the wood is prepared you should apply the stain outdoors not inside. The area should be cleared and have newspaper or a drop cloth. This provides protection for other surfaces from the product your using. The best method applying the product is spraying on the stain because it reaches all areas of the bench, table or chairs. After you spray the furniture you should wait for the stain sealant to dry completely. It will need a few coats to protect it because it is from indoors. Be sure to coat each piece completely underneath, joints, corners and leg bottoms. In bad weather move furniture to a safe storage shed, or cellar. Using a few pieces of furniture from indoors outside is acceptable. Wood furniture designed for outdoor is a better choice and last longer. Here are some ideas for using wood stains and sealant indoors on wood furniture. 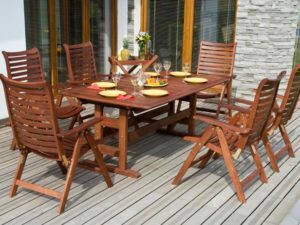 When you have purchased pressurized treated wood furniture for outdoors a stain and sealant provides excellent protection and makes it look better. Often staining furniture in the warmer weather makes it an easier process. The equipment that you will need is a pump sprayer, scrub brush, a garden hose with a nozzle. stain and sealant, paint brush, bucket for water, and clean rags. Tape over any metal parts you do not wish to stain and removable parts that you do want to stain. Remove dirt and grime using a deck wash or homemade solution of water and bleach. Using a pump sprayer clean off the furniture before applying the stain and sealant. Allow 24 hour for the wood furniture to dry after cleaning. The best method to apply the stain and sealant is a spray pump because it will reach every corner of the chairs, table, or pieces you want to treat. Let one coat dry before applying another. When using a brush go in the direction of the grain. Keep a bucket of water and cloth handy to wipe up any stains. Let it dry before applying a second coat. Adding a second coat provides a smoother more professionals appearance. Keep in mind that a combined stain and sealant provides better protection and saves you time on using two different products.